CDs are Dead. Long live CDs. I was running some stats on the Fedora 11 release, and an interesting thing caught my eye. Very few people are downloading the six (or in the case of PPC, seven) CDs to perform a “Fedora” install. Very Very few. In fact, at most, six people downloaded split media CDs using the Fedora mirror servers in the first few days. This in contrast to the over 234,000 direct downloads of DVDs and LiveCDs in the same amount of time. BitTorrent statistics are a little better for CDs: 908 completed downloads of the split media CDs, out of 41,235 total downloads (or ~2.2 %). A few more points lend credence to this idea. Looking only at the BitTorrent stats for Fedora 9, 10, and now 11, we see an interesting trend. Figure 1 shows that the interest in split media CDs has been decreasing over the past year. I have a suspicion. As the number of x86_64 users grows, it’s more likely that x86_64 systems will have DVD readers as opposed to older CD readers. Figure 2 shows the growth of x86_64 vs x86 over the past year, again extracted from BitTorrent statistics. The entire Fedora 11 release as sent to the mirrors is ~143GB. Of that, CD and DVD ISOs represent ~34GB; the split media CD ISOs represent ~15.5GB of that. As most of the rest of that 143GB is all hardlinked, we’re really only transferring out all these ISO files. 10% of the disk space, and 45% of the time/bandwidth needed to get a release out to the mirrors, for about 2% of the user base, and declining. CDs had their place, back when DVD readers weren’t commonplace, and before we had LiveCD/LiveUSB medias. Now, DVDs are fairly common, the LiveCDs work great for a lot of installs, and we have both a small (158MB) network-based bootable CD installer for new installs that would require a CD, and preupgrade for upgrading from an older distro version to the next. Let’s kill off split media CDs for Fedora 12. I didn’t manage to get these onto http://get.fedoraproject.org/, but we have metalinks available for all of the Fedora 11 main content, as well as the Fedora Electronics Lab spin. Metalinks can be used with metalink-aware download tools, like aria2 and the DownThemAll! FireFox plugin, to let the end user tool decide from which mirror to download the actual content. I’d like to take a moment to thank everyone involved in this Fedora election cycle. and of course the 5 individuals running for the Board seats and the 11 running for the FESCo seats. I appreciate the efforts you put into attending the Town Hall sessions, answering the questionnaire, and for the commitment you’ve shown to Fedora already. You have until 2359 UTC on 22nd June 2009 to vote. With each of the candidates noting they can attend at least one of the IRC Town Halls for their respective offices, the schedule is now set. Town Halls begin in about 12 hours. Each group participating in the election will host two Town Hall sessions on IRC. Each will last one hour, or less if there are no further questions. * Everyone should join #fedora-townhall on FreeNode (irc.freenode.net). Only candidates and a moderator may speak in this channel. 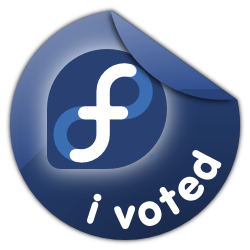 * Non-candidates should also join #fedora-townhall-public on FreeNode (irc.freenode.net). Direct your questions for the candidates to the moderator. fully inform our electorate about the candidates.